The House of the Hanged Man, 1873 was painted by Cezanne in a small town north of Paris named Auvers-sur-Oise. This oil on canvas work, measuring 21 X 26 inches, was signed by Cezanne at the lower left. The painting was exhibited at the First Impressionist Exhibition, held in 1874. Cezanne's submissions were badly received by the establishment art critics, who did not know what to make of his unorthodox style. Even so, this was one of the first works that Cezanne ever sold during his lifetime. In 1874, the painting was purchased by the Comte Armand Doria for 200 francs. In 1889 Doria traded it to Victor Chocquct in exchange for Melting Snow at Fontainebleau. At the estate sale of Chocquet's widow, it was acquired for 6510 francs by Comte Isaac de Casnondo on the recommendation of Claude Monet. The painting was included in the 1911 Casnondo bequest to the Louvre and entered the collection in 1914. The painting is now is on exhibition at the Musée d'Orsay in Paris. The House of the Hanged Man was painted in 1873 and depicts a picturesque cottage situated in Auvers near the Rue de Four. Despite the title, no suicide or hanging is known to have taken place there. Supposedly, the house had been owned by a Breton man named Penn'Du, which closely sounds like the French word for hanged man - Pendu. The canvas has been heavily worked and was actually signed by Cezanne. With his consent, the painting was exhibited several times during Cezanne's lifetime. These facts suggest that House of the Hanged Man was one of those few paintings with which he was satisfied. 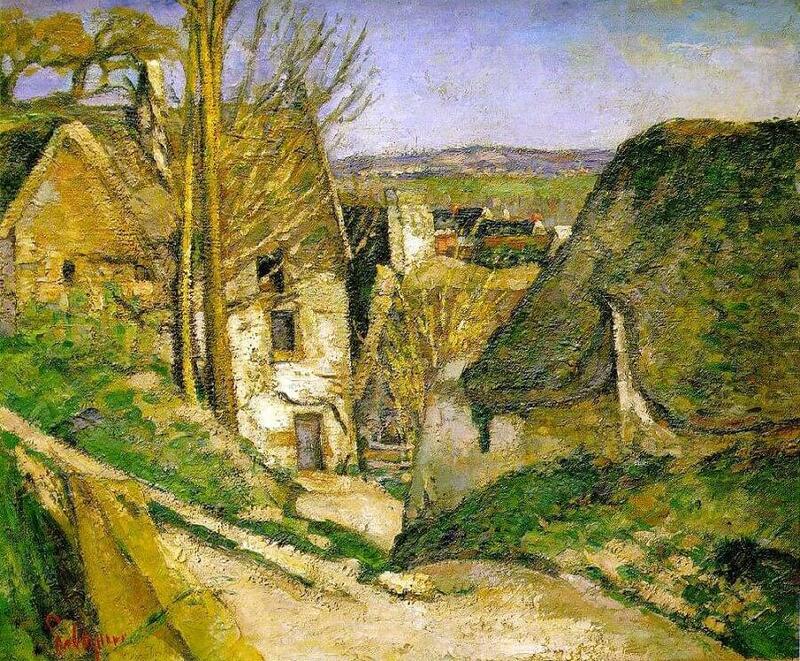 Cezanne lived in the Auvers area from 1872-1874 to be near his friend and mentor Pissarro. Taking advice from Pissarro, the painter abandoned the rough, dark manner of his early works and became a convert to the light, bright, and vibrant touch of Impressionism. Even so, the House of the Hanged Man has little in common with the flowing landscapes of Monet; as for those of Pissarro, the main similarity is only in the overall composition. A peasant, who had watched both Cezanne and Pissarro working together in the open air, said that Pissarro pricked the canvas with his brush while Cezanne laid the paint on as if he had a trowel! Cezanne's technique was to first paint a summary composition and then rework it by applying successive coats of paint that sculpted the canvas and emphasized the three-dimensionality of the scene. The two slender trees, the chimneys, and the edges of the roof protrude slightly from the dense and granular surface of the painting. The resulting effect has no parallel in Pissarro's work and anticipates Monet's paintings of Rouen Cathedral made in the 1890s. Cezanne's vision in this picture is no less unique than the method he used to paint it. The House of the Hanged Man depicts a landscape devoid of human presence and is depicted as an abandoned habitation, isolated, with cracked walls. The house seems almost to be an aberration of the natural terrain, emerging forth from the hillside. On the left side of the painting, the red and black roofs of the nearby village almost seem like a beacon of civilization. The sky occupies only a small area in the upper part of the painting. This painting is a key work in Cezanne's career and is widely regarded by art historians as a masterpiece of Cezanne's Impressionist period.